The goal of coral propagation efforts is to reseed reefs with coral colonies that can enhance the population recovery and eventually contribute to sexual reproduction, site propagation, and the recruitment of new corals. In addition to aiding in natural coral reproduction, outplanted corals also contribute to reef ecosystem health by increasing habitat space and complexity for other organisms. Thus, the outplanting phase is a crucial step in coral gardening efforts, where corals are transported from nurseries and secured back onto reef habitats. Outplanting also can be the most expensive and labor intensive part of coral restoration efforts due to long hours and many people needed using SCUBA and boats. Therefore, this phase should be undertaken with thoughtful planning to minimize the loss of nursery-reared corals. Below we discuss important considerations to maximize outplanting success. Several methods are commonly used for transporting and securing nursery-reared corals to reefs. The choice of which methods to use ultimately depends on the coral species being outplanted, the substrate type at the restoration site, and the environment at the site (such as intense waves or surges). However, for each program, the best outplanting methods will ensure maximum survivorship of corals over the long-term by allowing corals to naturally self-attach to the reef substrate. Best practices for each stage of the outplanting process are discussed below. When transporting corals from the nursery to the outplant site, reducing stress to the corals is of utmost importance. Corals should be transported during cooler and calmer times of the year, not during times of heat stress or increased storm activity. Placing shades over corals or transporting corals during overcast days or during the morning or evening can also reduce heat and light stress. Smaller fragments can be transferred to buckets, coolers, or trays that are filled with seawater, making sure the container has mesh or holes that are smaller than the size of the corals. Larger fragments (e.g., > 30 cm in size) have been transported by placing corals in large storage bins, coolers with wet bubble wrap, or on large sea-soaked foam sponges as cushioning on the boat floor with sea-soaked sheets or towels covering corals. In both methods, fresh seawater should be continually added to keep corals cool. The status of corals when they are outplanted is also an important consideration. Corals should not be outplanted if they exhibit any abnormal conditions such as recent tissue loss, discoloration, paling/bleaching, or parasites. Because of the costs of maintaining corals in a nursery, it is best to outplant corals as soon as they are large enough to have a good chance of survival after transplantation. Evidence suggests that larger colonies have better survival rates after outplanting as they are able to withstand and overcome partial mortality, predation and colony fragmentation better than smaller colonies. ref Most projects today find good success by outplanting branching corals between 5-15 cm diameter for branching corals and 4-5 cm diameter for massive, boulder species. 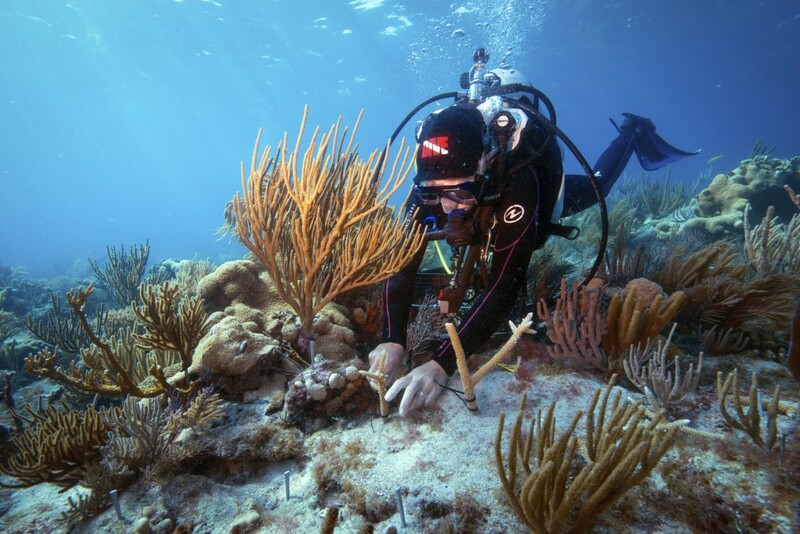 Corals are outplanted by securing them to the reef using a variety of attachment methods. The attachment method should be tested and will partially be determined by the coral species being outplanted, the type of substrate at the outplant site, and site conditions. Before any attachment method is used, all fouling organisms and sediment should be cleared from the substrate using small wire brushes and scrapers. In higher wave energy areas, it is best to use materials to secure corals to the reef. In general, several points of contact should be made between the coral and the substrate (for branching corals) to promote self-attachment. The most common attachment methods are 2-part epoxy, nail and cable tie, Portland cement, and nails with nylon cable ties or coated wires,ref but the best attachment method and materials depend on the environment and coral species. For instance, nails and cable ties are a good method for branching corals, while cement is best option for boulder corals. Several new methods are being developed to outplant large numbers of large-sized colonies onto reefs. For example, ‘floating outplants’ are made with corals attached to floating, vertical lines until the corals are ready to be outplanted. 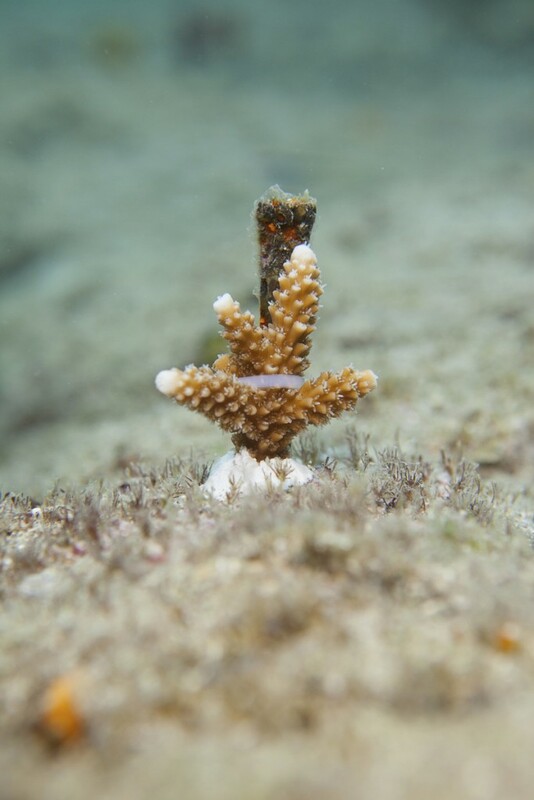 During outplanting, the vertical line is separated from the float and placed on the reef substrate, where it is secured in several places to stabilize the entire structure and promote corals self-attaching to the substrate. Finally, all or a subset of the outplanted corals should be carefully labeled and/or mapped for future maintenance and monitoring activities. To do this, GPS coordinates should be recorded or tags should be deployed near outplants that are clearly visible. There are various types of tags that have been used and are not limited to: cable ties, cattle tags, laminated cards, plastic engraved tags, and metal punched tags. 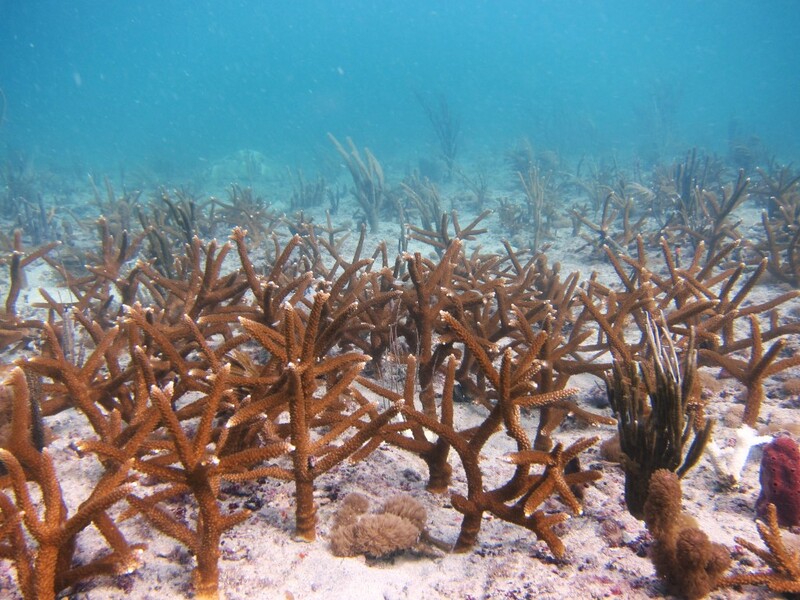 Much research has gone into determining which outplanting designs (such as density, spacing, and arrangement) maximize the survivorship and growth of outplanted branching corals. However, there still does not appear to be one “best” design. For example, branching corals often form thickets, and many positive effects occur in these high densities. These include higher growth rates because more fish are attracted to thickets and provide nutrients through their waste products. ref Dense thickets may also increase coral survivorship by increasing stability due to branch fusion. However, studies placing corals in close proximity showed reduced growth rates due to overcrowding of branches and higher incidences of coral predation, disease and damselfish predation. ref Therefore, a few general rules of thumb are suggested for outplanting designs that maximize coral success. In low wave energy areas, wedging small coral fragments into cracks and crevices can work for branching corals that survive well with asexual reproduction (ie.e, fragmentation), such as acroporids, fungiids, and some species of Montipora and Pocillopora. In addition, outplanting corals to the natural environment should not occur at distances greater than 500 km from the original location of donor colonies. This is because there is likely to be limited genetic transfer between populations separated by greater than 500 km. This careful planning can help reduce outbreeding depression, where mating occurs between individuals that are strongly adapted to local conditions (ecotypes).